I may have mentioned this before but I seem to think my property needs to be some sort of family fun center. I feel like I'm constantly building things so we can all have more fun here. It's as much about the process as it is about the end product though. I just love to build. 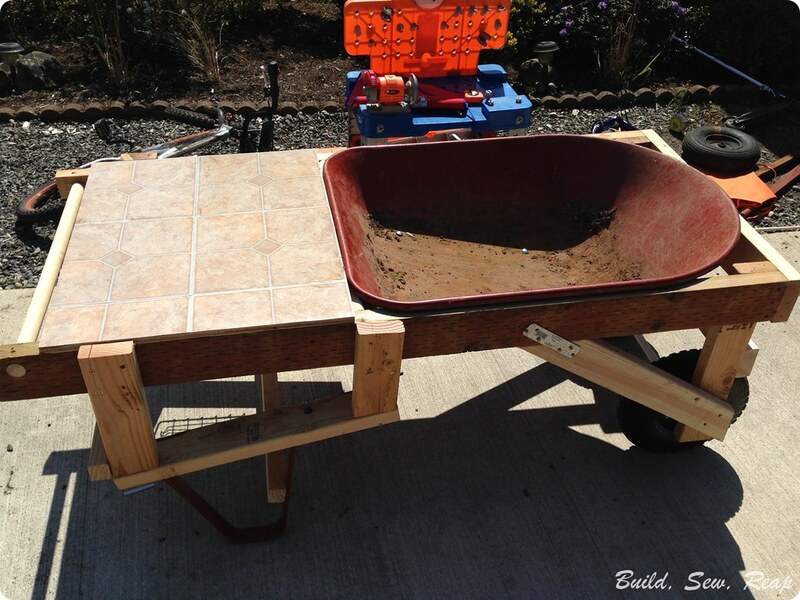 One of my recent projects was to convert our broken old wheelbarrow into a mud kitchen for the kids. Once again, as with some past projects, my goal was to purchase as little as possible and use recycled scrap materials. 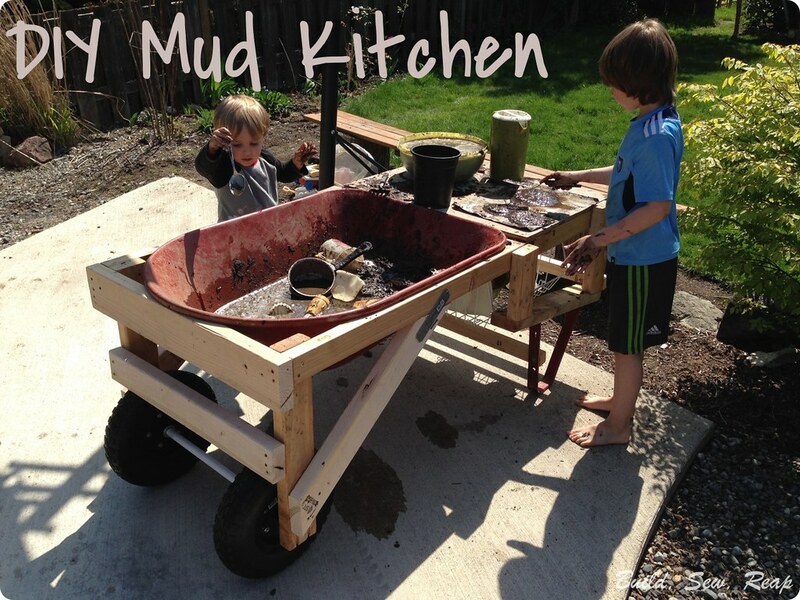 I had seen versions of the mud kitchen around Pinterest but didn't have the impetus to make it happen until I stumbled upon an estate free (like an estate sale only stuff was all free) and I was able to get a ton of great kitchen utensils and containers for it. Once I had those, I knew I had to get working on the build. 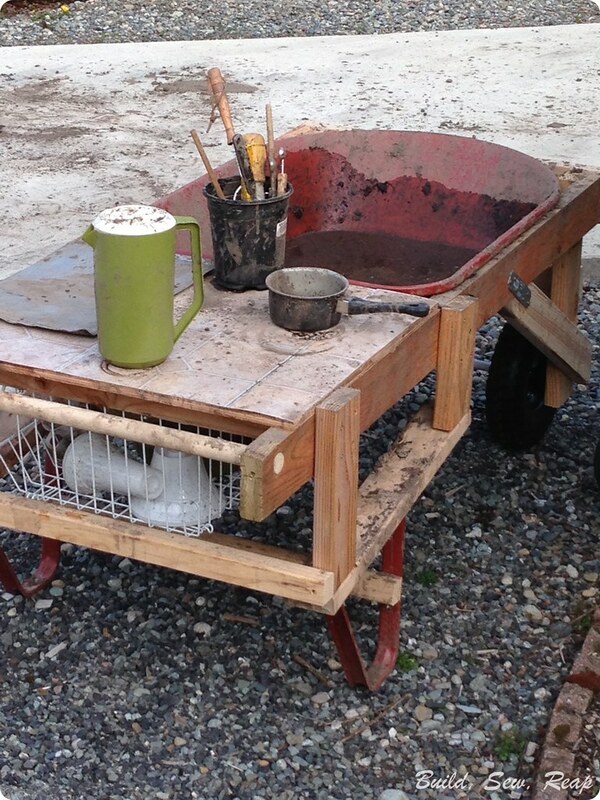 Our old wheelbarrow had a broken handle and while I had fixed it once, it also had a flat tire more often than not and was suffering in a number of ways. 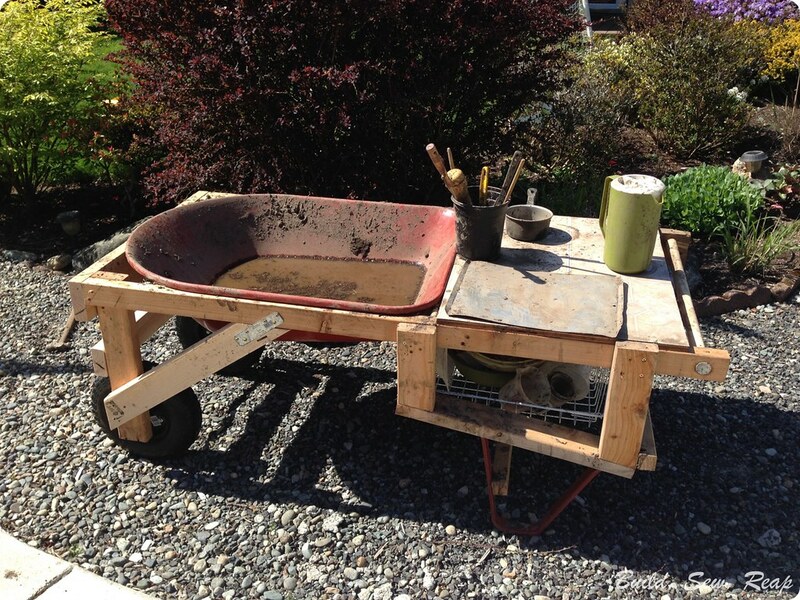 I treated us to a great new wheelbarrow with steel handles and a no-flat tire so I didn't hesitate to dismantle the old one. 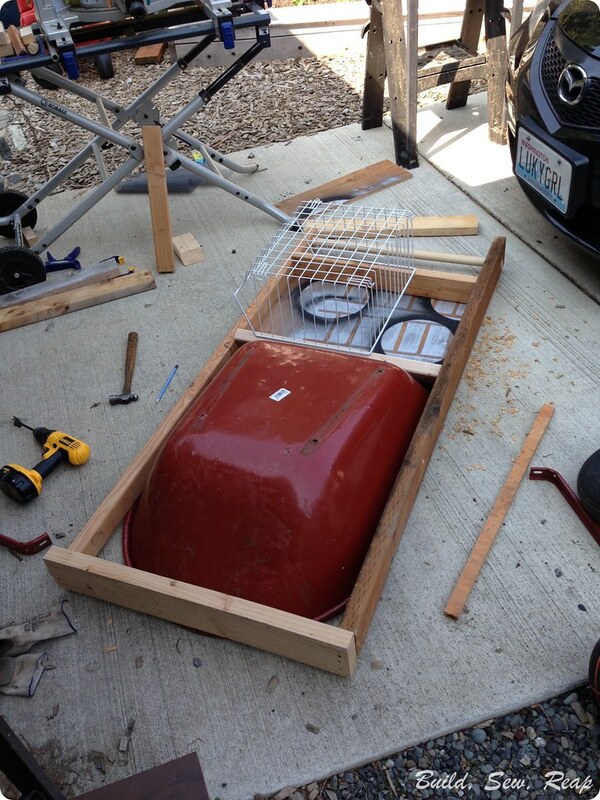 Once that was in parts, I built a frame around the basin. I built the frame based on the lumber I had to work with so I made it as long as possible with one section to hold the basin and another section for the work top area (the back side of that has the spray painted circles you see here. Apparently I used that as a dropcloth at some point). I also found a hanging wire basket at the estate free so I mounted that underneath. Finally, one end has a dowel handle that's well secured. If you have questions about exactly how it all went together, I can be more specific so just leave a comment and I'll follow up. I didn't set out with much of a plan since I had to just work with the materials I already had. That meant lots of strange angles and hinky support systems but it is strong and it can easily be rolled around our yard. 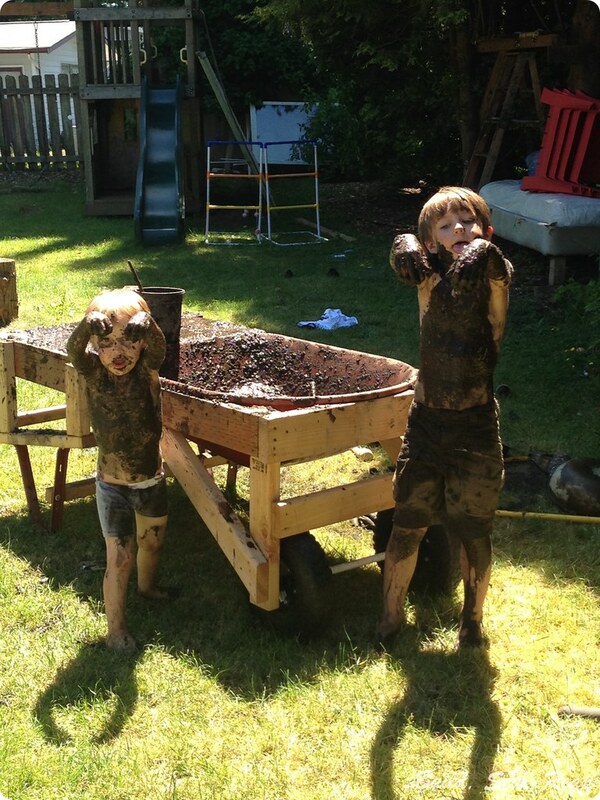 Good for hours of good, clean, dirty, fun. The kitchen is a room that calls for a large outlay of money, but once it is wisely built, you'll be happy you made the investment. Thank you very much, I had the best design for my little kitchen the Tango's designer did a fantastic jon. I received modern kitchen designs and my husband and I chose the last one their designer justed, so happy about our decision . The green alternative is keeping your current appliances. Give your old appliances a brand new look by painting them with appliance paint. Please let me know if you’re looking for a article writer for your site. You have some really great posts and I feel I would be a good asset. If you ever want to take some of the load off, I’d absolutely love to write some material for your blog in exchange for a link back to mine. Please send me an email if interested. Thank you! Is my site GDPR compliant? For those thinking of buying a Gas grills or upgrading to a gas grill for grilling, there are a number of things to consider before purchasing one. enttry into the business market culd become a significant source in the coming years. Surveillance has also increased thanks too the internet. Cyber Monday has become almostt as big as Blaack Friday thanks to the internet.